It is a key Market Monetarist position that there is good and bad deflation and therefore also good and bad inflation. (For a discussion of this see Scott Sumner’s and David Beckworth’s posts here and here). Basically one can say that bad inflation/deflation is a result of demand shocks, while good inflation/deflation is a result of supply shocks. Demand inflation is determined by monetary policy, while supply inflation is independent of whatever happens to monetary policy. The problem is that the only thing that normally can be observed is “headline” inflation, which of course mostly is a result of both supply shocks and changes in monetary policy. However, inspired by David Eagle’s work on Quasi-Real Indexing (QRI) I will here suggest a method to decompose monetary policy induced changes in consumer prices from supply shock driven changes in consumer prices. I use US data since 1960 to illustrate the method. Below is shown the decomposition of US inflation since 1960. In the calculation of demand inflation I have assumed a constant growth rate in yp around 3% y/y (or 0.7% q/q). More advanced methods could of course be used to estimate yp (which is unlikely to be constant over time), but it seems like the long-term growth rate of GDP has been pretty stable around 3% of the last couple of decade. Furthermore, slightly higher or lower trend growth in RGDP does not really change the overall results. We can of course go back from growth rates to the level and define a price index for demand prices as a Quasi-Real Price Index (QRPI). This is the price index that the monetary authorities can control. The graph illustrates the development in demand inflation and supply inflation. There graph reveals a lot of insights to US monetary policy – for example that the increase in inflation in the 1970s was driven by demand inflation and hence caused by the Federal Reserve rather than by an increase in oil prices. Second and most interesting from today’s perspective demand inflation already started to ease in 2006 and in 2008 we saw a historically sharp drop in the Quasi-Real Price Index. Hence, it is very clear from our measure of the Quasi-Real Price Index that US monetary policy turning strongly deflationary already in early 2008 – and before (!) the collapse of Lehman Brothers. It is clear that many people (including many economists) have a hard time comprehending NGDP level targeting. However, I am pretty certain that most people would agree that the central bank should target something it can actually directly influence. The Quasi-Real Price Index is just another modified price index (in the same way as for example core inflation) so why should the Federal Reserve not want to target a path level for QRPI with a growth path of 2%? (the clever reader will of course realise that will be exactly the same as a NGDP path level target of 5% – under an assumption of long term growth of RGDP of 3%). In the coming days I will have a look at the QRPI and US monetary history since the 1960s through the lens of the decomposition of inflation between supply inflation and demand inflation. I am highly uncomfortable with calling N “demand-side” and calling Y “supply-side”. The level of Y is endogenous and depends both on AD and AS factors. Granted the trend Y (the Solow level, the long-run level, whatever you want to call it) is a supply-side phenomenon, but not the Y we actually see in the data. I’m probably missing something elementary somewhere. Let me sound off for a minute at the risk of sounding foolish. I accept everything up to (5). Now in (5) you substitute in what is essentially an LRAS equation for output. That closes the model just fine, but one could also close the model with a SRAS curve and make Y truly endogenous. I’ll mull over it. Does your figure pass the smell test? I can “see” the 1973, 1978 and 1991 oil shocks; that’s good. One can rationalize 2008-2009 with high “supply-side” inflation due to oil prices and low “demand-side” inflation due to falling AD. I have half a mind to run an HP filter through the GDP data instead of using a single 3% trend for the entire time-series but I don’t think it’ll change things too much. I like the post, but I think the real thing is that central bankers have a consistent, pro-growth policy that they publicly follow. I agree the there a weaknesses in calculate y as a fixed growth rate of 3%. However, I have tried other measures and it does not change the outcome significantly. And as you correctly note the method I have used does indeed pass the smell – the oil shock in 1973-74, 1978 and 1991 (and 2008!) are clearly visible in the data. In terms of using a HP-filter it is clear that that would make sense and I might indeed to that in later versions of my QRPI. I have also tried 10y moving averages. Again the results are much the same. It really does show up the Fed’s failure in 2008. It also shows a general inflationary bias by the Fed: which, of course, made its sudden shift to deflation all the more disastrous. You would think the evidence for providing a nominal anchor by a clear policy target was pretty clear: but apparently not. Excellent post Lars. Definitely gives me some good food for thought. I’ve been following your posts on David Eagle’s work, but now that my semester is over, I need to take advantage and start to read Eagle’s work for myself. Keep up the good work. 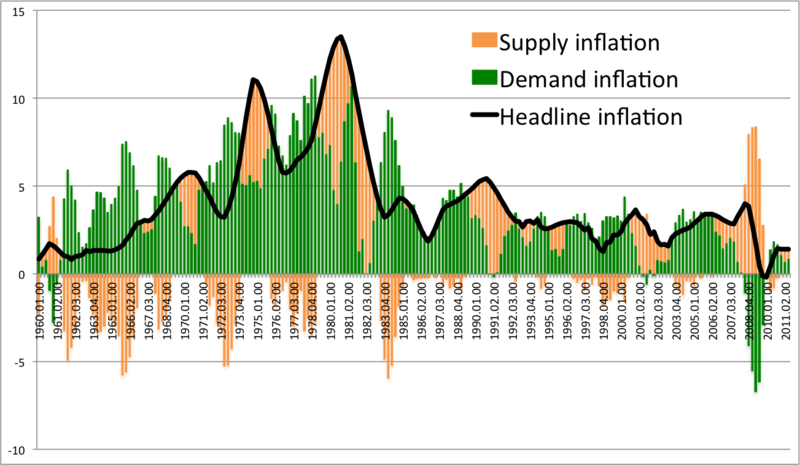 Interesting that your chart shows historically low levels of both demand AND supply side inflation – which, as Benjamin Cole has already pointed out, results in a lower than normal headline inflation number. The 2% fetish is baffling.